Welcome to lesson 6 of a semester-long undergraduate-level course in Human Anatomy! This is our last lesson on the back. After going over the bones, ligaments, and joints of the spinal column in lesson 3, the CNS and somatic nervous system in lesson 4 and the autonomic nervous system in lesson 5, we are finally ready to tackle the overall shape and movement of the spine and the muscles of the back that produce those movements. After today, we will be moving to the other side of the body and begin our investigation of the thorax. At birth, the entire spine is curved so that the anterior aspect is concave. 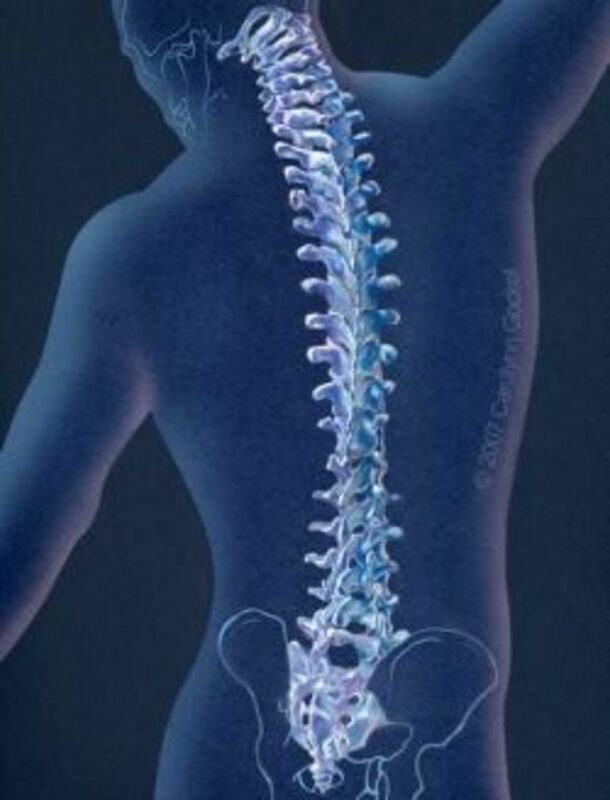 This is the primary curvature of the spine which is maintained, at least partially, into adulthood. The vertebral column as a whole, though, changes shape. The cervical part of the vertebral column becomes convex in anterior aspect when an infant begins to hold its head upright, and the lumbar region becomes convex on the anterior side when a child begins to stand up and walk. In both of these regions, the height of the vertebral body is greater on the anterior side than the posterior side, so that the vertebral column curves backward. The bony elements of the sacrum are fixed and therefore maintain their primary curvature. An adult, then, has two primary curvatures, otherwise known as kyphoses, in the thoracic region and in the sacrum, and two secondary curvatures, otherwise known as lordoses, in the cervical and lumbar regions. The vertebral column is capable of flexion, extension, lateral flexion, rotation, and a limited form of circumduction. The vertebrae themselves can only move slightly relative to one another, but when summed across the entire vertebral column this movement becomes more substantial. The primary purpose of the vertebral column is to protect the spine, and so there are a number of mechanisms that limit movement between vertebrae and across the vertebral column. Articular processes/facet joints: remember from our discussion of the vertebra how the vertebral arches of two vertebrae fit together - superior articular processes from underlying vertebrae articulate with inferior articular processes from overlying vertebrae. These articulations form synovial zygapophyseal joints that limit movement to an extent depending upon the shape of the articulation between the two surfaces. In the cervical region, the joints between articular processes face in a posterior and superior direction, which allows a moderate degree of movement in all directions. The joints between articular processes in the thoracic region are oriented in a coronal plane, which permits a fair amount of movement in all directions. However, the articulation of thoracic vertebrae with ribs greatly restricts spinal movements in the thorax. The joints between articular processes in lumbar vertebrae are oriented in a sagittal plane, which allows a fair amount of flexion, extension, and lateral flexion, but little to no rotation. Intervertebral ligaments: the ligaments you learned about in lesson #3 prevent excessive flexion, extension, and lateral flexion of the vertebral column. In particular, the supraspinous ligament, nuchal ligament, interspinous ligaments, ligamenta flava, and posterior longitudinal ligament all prevent excessive flexion. The anterior longitudinal ligament prevents excessive extension, and the ligamenta flava and tiny intertransverse ligaments and muscles prevent excessive lateral flexion. Iliolumbar ligament: the superior surface of the first sacral body is tilted anteriorly, so that it has a tendency to "slide" forward during normal upright posture. The iliolumbar ligament runs from the anterior surface and tip of the transverse process of L5 to the iliac crest of the pelvis, and helps reinforce the lumbar and sacral parts of the vertebral column relative to the pelvis. The muscles in the back can be partitioned into superficial, intermediate, and deep muscles, depending on how hard they are to get to. 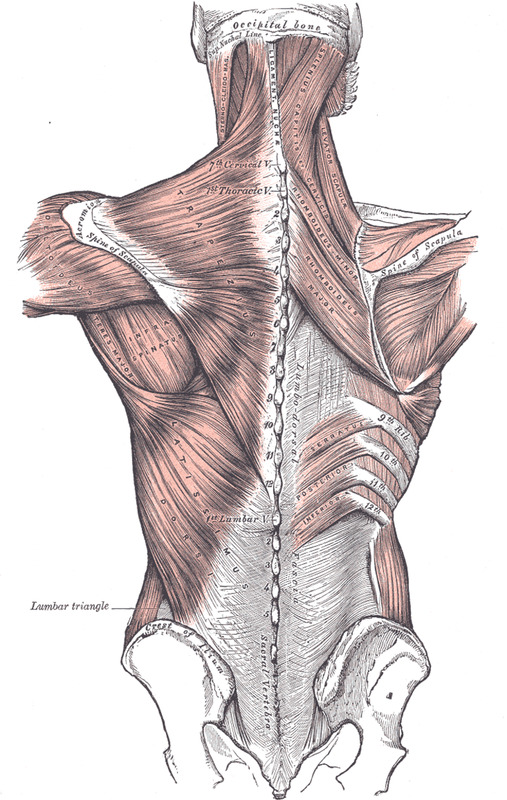 There are four muscles in the superficial group: trapezius, latissimus dorsi, rhomboid minor, and rhomboid major; two in the intermediate group: serratus posterior superior and serratus posterior inferior; and a total of 9 named muscles in the deep group, including splenius, the erector spinae musculature (here counted as one muscle), and the muscles in the transversospinales and suboccipital muscle groups. Trapezius: All of the muscles in the superficial group are "immigrant" muscles that stem from embryological precursors in other parts of the body. The trapezius muscle is embryologically a muscle of the head and neck, which explains its innervation by cranial nerve XI, the accessory nerve. 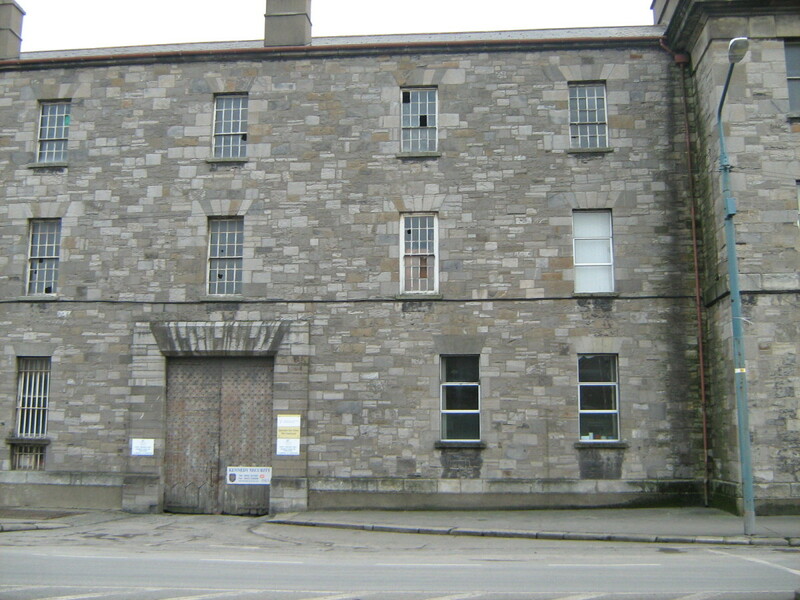 Together, the two halves of the trapezius are, as the name suggests, shaped like a trapezoid. Each muscle is triangular, with the apex of the triangle pointed toward the shoulder joint and the base along the spinous processes of the vertebrae. The trapezius arises from the medial part of the superior nuchal line on the occipital bone, the nuchal ligament, and spinous processes of T1-T12, and sweeps laterally to insert broadly onto the clavicle and scapula. The superior fibers of trapezius, the ones that run "down" the superior side of the triangle, insert on the acromion process of the scapula and lateral third of the clavicle; the middle fibers of trapezius run in a largely mediolateral direction to insert onto the scapular spine and the medial edge of the acromion; and the inferior fibers, the ones that run "up" the inferior side of the triangle, insert onto the tubercle of the scapular spine. As noted above, the trapezius is innervated by the accessory nerve, which passes deep to its fibers in a superoinferior direction. The trapezius works mostly to move the upper limb, in particular to retract the scapula. However, it IS a large muscle with fibers running in three different directions, and its fibers can work somewhat independently of each other. Its superior fibers elevate the scapula and shoulder, its inferior fibers retract and depress the scapula (pull it inferiorly), and its superior and inferior fibers working together rotate the scapula so that the glenoid fossa faces more superiorly. Latissimus dorsi is embryologically a muscle of the upper limb that migrated into the lower portion of the back to cover intrinsic back muscles. It arises from a large aponeurosis attached to the posterior aspect of the iliac crest of the pelvis and tips of vertebral spinous processes from the sacrum to around T6. Its fibers sweep superiorly and laterally to converge on a tendon that inserts into the intertubercular sulcus on the anterior side of the proximal humeral shaft. The latissimus dorsi AD-ducts, extends, and medially rotates the humerus. Many students have difficulty understanding how the latissimus dorsi medially rotates the humerus. Pay special attention to how the fibers of latissimus dorsi start posteriorly on the back and run in a lateral and anterior direction between the thorax and the humerus to insert onto the anterior side of the humerus. When the latissimus dorsi contracts, it causes the humerus to rotate medially around a superoinferior axis. The latissimus dorsi muscle is innervated by the thoracodorsal nerve, with contributions from C6 to C8 spinal cord levels. Rhomboids: The trapezius and latissimus dorsi muscles need to be removed or reflected in order to see the next two superficial muscles, the rhomboid minor and rhomboid major. The two rhomboid muscles are, as their name suggests, rhomboidal in shape. They have embryological origins in the hypaxial region outside the back proper, so they are innervated by branches from the anterior rami of spinal nerves. The rhomboid minor is a small slip of a muscle that arises from the nuchal ligament and the spines of C7 and T1 and attaches to the medial border of the scapula directly opposite the root of the scapular spine. The rhomboid major is "taller," and runs from its origin on the vertebral spinous processes of T2 to T5 to insert onto the medial border of the scapula from the spine down to its inferior border. The fibers of both rhomboid muscles run in an inferior and lateral direction from origin to insertion. Both rhomboids are innervated by the dorsal scapular nerve, with contributions from C4 and C5 spinal levels. The rhomboid muscles retract and elevate the scapula and work with other muscles to rotate the glenoid fossa of the scapula superiorly. Posterior serratus muscles: The more superior of the two intermediate muscles of the back, the serratus posterior superior, can only be seen when the trapezius and rhomboid muscles are reflected or removed. This muscle arises on the spinous processes of C7 to T3 vertebrae and supraspinous ligaments and inserts onto the upper borders of ribs 2 to 5. The fibers of serratus posterior superior run in a superoinferior direction from origin to insertion. The serratus posterior superior muscle pulls the ribs to which it attaches backward and upward, expanding the volume of the rib cage a bit. The more inferior of the two muscles, serratus posterior inferior, can only be seen when the latissimus dorsi muscle is reflected or removed. It arises on the spinous processes of T11 to L3 vertebrae and runs in a superior and lateral direct to attach to the lower borders of ribs 9 to 12. Serratus posterior inferior acts to pull the ribs to which it attaches backward and downward, slightly expanding the volume of the rib cage. The two muscles together were once referred to as the "respiratory muscles" because of this, but it is doubtful that they have any role in breathing. Both serratus posterior muscles are innervated by anterior rami of thoracic nerves, with contributions from spinal levels T2 to T5 for serratus posterior superior and T9 to T12 for serratus posterior inferior. In order to see the deep muscles of the back, it is necessary to remove the trapezius, latissimus dorsi, rhomboids, and serratus posterior muscles. The deep back muscles in the neck are then easily discerned, since they are covered only by a deep fascia. The deep back muscles in the trunk are covered by two layers of deep fascia, the more superficial of which is a very thick layer called the thoracolumbar fascia. The deep back muscles themselves can be partitioned into three groups: a superficial group made up of splenius, spinalis, longissimus, and iliocostalis; a deep group made up of semispinalis, multifidus, and rotatores; and four suboccipital muscles high in the neck. Splenius muscles arise from the lower half of the nuchal ligament and spinous processes of C7 to T6 and run superiorly and laterally to insert onto the cranium and transverse processes of cervical vertebrae. The more inferior fibers make up the splenius cervicis, and run from the spinous processes of T3 to T6 to insert onto the transverse processes of C1 to C3. More superior fibers make up the splenius capitis, and insert onto the mastoid process and lateral half of the nuchal line of the cranium. The splenius muscles are innervated by posterior rami of middle and lower cervical spinal nerves. Firing together, the muscles on the right and left sides extend the head and neck. Firing on the left or right alone, the splenius muscles rotate the head toward the ipsilateral side, i.e., so that the face faces the side of the neck on which the splenius muscles are firing. The two splenius muscles are sometimes called spinotransversales muscles, since they run from the spinous processes in the midline laterally toward transverse elements on the head and transverse processes on the vertebrae. Erector spinae muscles: The next three muscles in the superficial group of deep back muscles are often referred to as erector spinae muscles. If you like to eat pork loin then you know exactly what the erector spinae muscles are. These muscles develop from epaxial muscles in the embryo, so they are innervated by posterior rami of spinal nerves. As a group, they all extend the vertebral column and, if acting on one side, laterally flex it. In addition, they also control flexion of the vertebral column by contracting and relaxing in a coordinated fashion, and, for the parts of the erector spinae muscles that attach to the head, they weakly turn the head to the ipsilateral side. Each of the erector spinae muscles takes on the name of the region it crosses, in part: so, for example, the spinalis muscle is called spinalis thoracis in the thorax, spinalis cervicis in the neck, and spinalis capitis attaching to the head. It is not important for our purposes to make these distinctions, as they overly complicate the issue. Spinalis is a thin, flimsy, highly tendinous muscle that arises from multiple heads on the spinous processes of lower vertebrae to insert onto spinous processes of higher vertebrae. 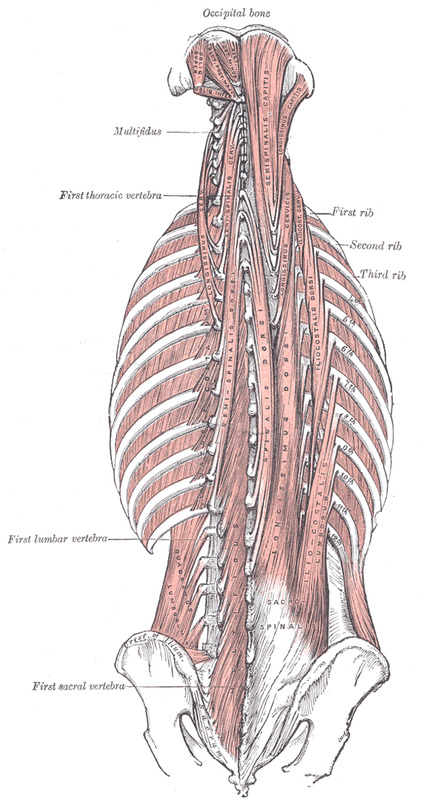 In the thoracic region, lower fibers of spinalis run from T10 to L1 to insert onto spinous processes of T1 to T8. In the cervical region, fibers run from the nuchal ligament and spinous process of C7 to insert onto the spinous process of C2. The spinalis fibers that attach to the head usually blend with the semispinalis capitis muscle on that side. Longissimus is a long muscle that arises from an aponeurosis that attaches to the sacrum and medial part of the iliac crest and ascends to attach to transverse processes and ribs at higher levels in the back. Longissimus fibers in the thorax blend with iliocostalis in the lumbar region, but mostly originate on transverse processes of lumbar vertebrae, and ascend superiorly and medially to attach to transverse processes of thoracic vertebrae and ribs 3 through 12. In the cervical region, longissimus fibers run from transverse processes of T1 through T5 and run superiorly to insert onto transverse processes of C2 to C6. Longissimus fibers that insert onto the head run from transverse processes of T1 through T5 and articular processes of C4 to C7 and run superiorly to insert onto the posterior margin of the mastoid process, just deep to the insertion of splenius. Iliocostalis is the lateral muscle of the three, arising from an aponeurosis that attaches to the sacrum and medial part of the iliac crest, spinous processes of lumbar and the lower two thoracic vertebrae and their supraspinous ligaments, and the angles of ribs 3 to 12, and runs to the transverse processes of C4 to C7 and the angles of all 12 ribs. The higher fibers of this muscle arise from the ribs directly, near their angles, and insert onto the upper six ribs and the transverse processes of vertebrae C4 to C6. The deep group of deep back muscles includes semispinalis, multifidus, and rotatores. These muscles are sometimes referred to as the transversospinales muscles, since they run obliquely upward and medially from transverse processes to spinous processes. The erector spinae muscles need to be removed before this deep group in the back can be seen. Semispinalis muscle fibers begin in the lower thorax, cross four to six vertebrae, and attach to spinous processes in the thorax, cervical region, and cranium in the occipital region. 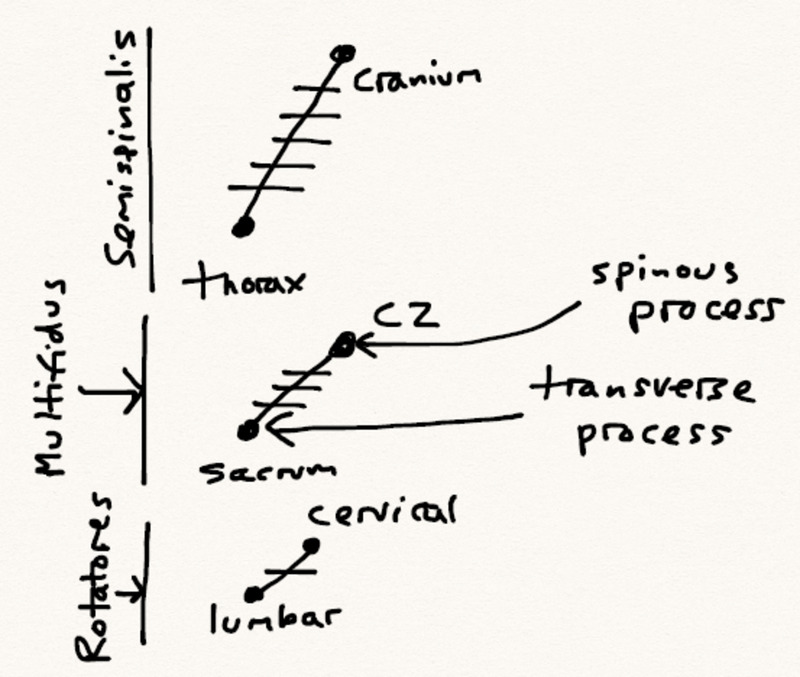 Semispinalis fibers in the thorax originate from transverse processes of T6 to T10 and run to spinous processes of C6 to T4; in the cervical region, fibers originate from the transverse processes of T1 through T5 or T6, and attach to spinous processes of C2 to C5; semispinalis capitis runs from transverse processes of T2 to T6 or T7 and articular processes of C4 to C6, and attaches to the cranium between the superior and inferior nuchal lines of the occipital bone. Semispinalis is innervated by the C2 spinal nerve, which is called the greater occipital nerve (see below). 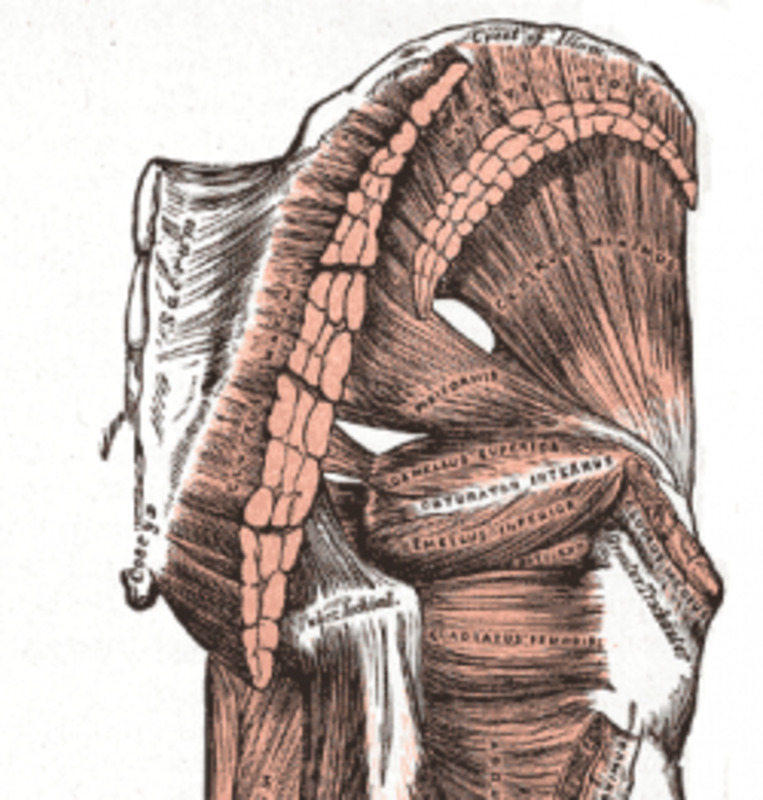 Multifidus muscle fibers are deep to the fibers of semispinalis, originate from multiple heads on the sacrum, posterior superior iliac spine, mammillary processes of lumbar vertebrae, transverse processes of thoracic vertebrae, and articular process of C4 to C7, and sweep upward to attach to the bases of spinous processes of vertebrae from C2 to L5. Multifidus fibers therefore span the length of nearly the entire vertebral column, and span between two and four vertebrae from inferior origin to superior attachment. Rotatores muscle fibers are deep to the semispinalis and multifidus muscle fibers. Rotatores fibers pass upward and medially from transverse elements (mammillary, transverse, and articular processes) to spinous processes in the lumbar, thoracic, and cervical regions. In general, rotatores muscle fibers are best developed in the thoracic region, spanning one to two vertebrae. The fibers of rotatores are so deep that they insert onto the spinous processes where they meet the vertebral laminae. The four suboccipital muscles are deep to the semispinalis capitis and either connect the axis to the atlas or connect the axis and atlas to the cranium. These four muscles are the rectus capitis posterior minor, rectus capitis posterior major, obliquus capitis inferior, and obliquus capitis superior. They are all innervated by the posterior ramus of C1, the suboccipital nerve (see below). Rectus capitis posterior minor is the smallest of the four muscles, running from the posterior tubercle of the atlas to the nuchal plane of the occipital bone just behind the foramen magnum and deep to the insertion of semispinalis capitis. This muscle crosses the atlanto-occipital joint, so it extend and laterally flexes the head on the atlas but does not rotate the head. Rectus capitis posterior major runs from the spinous process of the axis to attach to the cranium just lateral to the insertion of rectus capitis posterior minor. This muscle rotates the head and atlas on the axis toward the ipsilateral side. Obliquus capitis inferior also originates on the spinous process of the axis, and runs to the tip of the transverse process of the atlas. Like the rectus capitis posterior major, this muscle rotates the head toward the ipsilateral side. 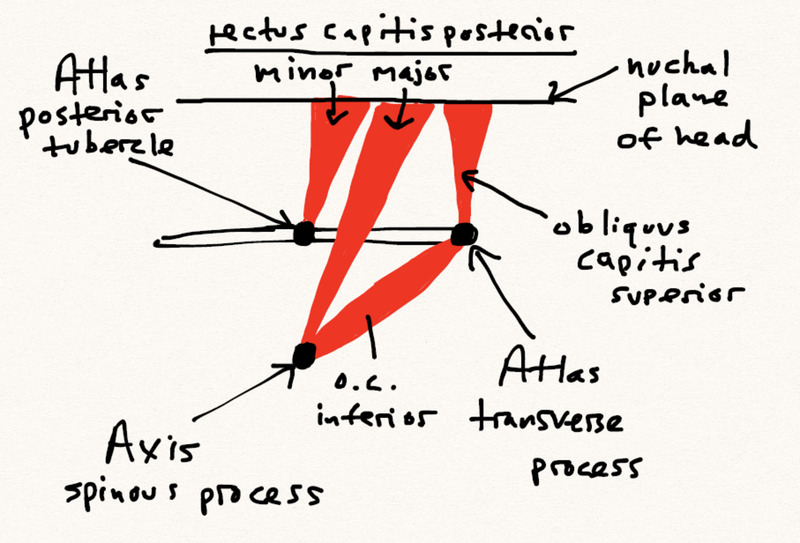 Obliquus capitis superior originates on the transverse process of the atlas and runs obliquely upward to insert onto the cranium just superficial to the rectus capitis posterior major. Like rectus capitis posterior minor, obliquus capitis superior crosses the atlanto-occipital joint, so it extends and laterally flexes the head on the atlas but does not rotate the head. 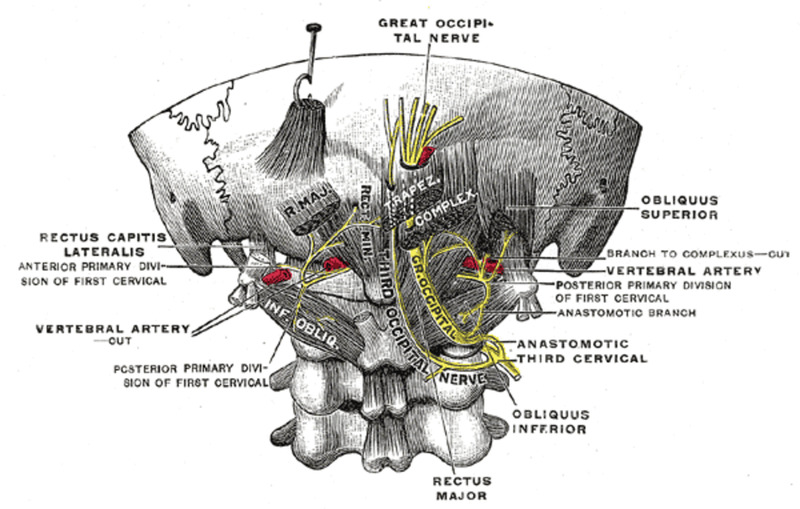 Suboccipital triangle: The rectus capitis posterior major, obliquus capitis inferior, and obliquus capitis superior form the suboccipital triangle, in which the posterior arch of the atlas, vertebral artery, and 1st cervical spinal nerve run. Finally, there are three groups of muscles that have embryological origin in epaxial regions, and can therefore be considered true deep muscles of the back: levatores costarum, interspinales, and intertransversarii. They are all innervated by posterior rami of spinal nerves. Students in my Human Anatomy course at Benedictine during spring 2019 do not need to know details about these muscles, just that they exist. Levatores costarum muscles originate on the transverse processes from C7 to T11, run obliquely inferiorly and laterally and insert onto the rib below the vertebra of origin around the tubercle. Contraction of levatores costarum fibers elevates the ribs. Interspinales pass between adjacent spinous processes on either side of the interspinous ligaments in the lumbar and cervical regions. Intertransversarii run between adjacent transverse processes. Interspinales and intertransversarii are generally only present in the lumbar and cervical regions, and are replaced by connective tissue in the thorax. Both sets of muscles stabilize adjoining vertebrae during movements of the vertebral column. The "superficial" group of back muscles primarily works on the humerus and/or scapula at the shoulder joint, not on the back or spine per se, although the splenius muscles do extend and rotate the head and neck. The "intermediate group" of back muscles work on the ribs. In general, the deep muscles of the back are all (1) from epaxial embryological precursors, (2) innervated by posterior rami of spinal nerves, and (3) extend the spine and, if fired on one side, laterally flex the spine to the ipsilateral side. The suboccipital muscles of the back that are dissected at the same time as back muscles also come from epaxial precursors and are innervated by posterior rami of cervical spinal nerves. These muscles act on the axis, atlas, and head to extend, rotate, and laterally flex the head and neck. The "minor epaxial muscles" stabilize the spine and work as antagonist muscles for many of the muscles that move the spine. Posterior rami of spinal nerves innervate the parts of the body wall that developed from epaxial portions of dermomyotomes, including deep muscles of the back. 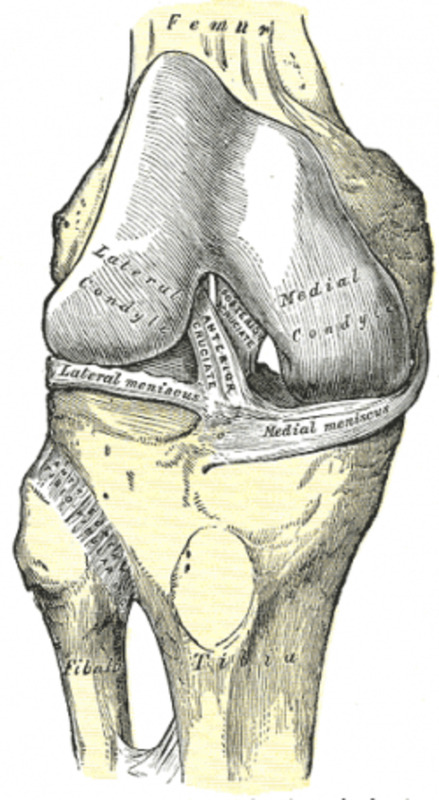 Posterior rami divide into a medial branch for muscles close to the midline and nearby vertebrae, joints, and ligaments and lateral branches for muscles away from the midline. Above the T6 spinal nerve, the medial branches supply muscles and the overlying skin of the back. Below T6, the lateral branches supply the skin instead. Below, I will go over the characteristics of the various posterior rami, starting with the first three posterior rami, which are exceptional and have special names. Students in my fall 2018 Human Anatomy course at Benedictine University just need to know the greater occipital nerve at this point. Suboccipital nerve: the posterior ramus of C1 innervates the four suboccipital muscles, and so it is called the suboccipital nerve. It also sends a branch to the overlying semispinalis capitis. C1 spinal nerve often has no posterior root, and therefore no sensory component. In this case, the posterior ramus of C2 takes over cutaneous innervation and sensory innervation of the suboccipital muscles. Greater occipital nerve: the medial branch of the posterior ramus of C2 is unusually large, so it is called the greater occipital nerve. It turns around the lower border of obliquus capitis inferior, sends a communicatory branch to the suboccipital nerve, enters and innervates the semispinalis capitis, emerges, lies deep to trapezius, then pierces trapezius to enter the superficial fascia of the scalp, supplying skin along the way. 3rd occipital nerve: the medial division of the posterior ramus of C3 is called the 3rd occipital nerve, and pierces the semispinalis capitis and trapezius before entering the superficial fascia of the neck, supplying skin up to the external occipital protuberance. Posterior rami of C6, C7, C8, L4, L5: Posterior rami of C7 and C8, and sometimes C6, have no cutaneous distribution, and the posterior rami of L4 and L5 have an insignificant cutaneous distribution. 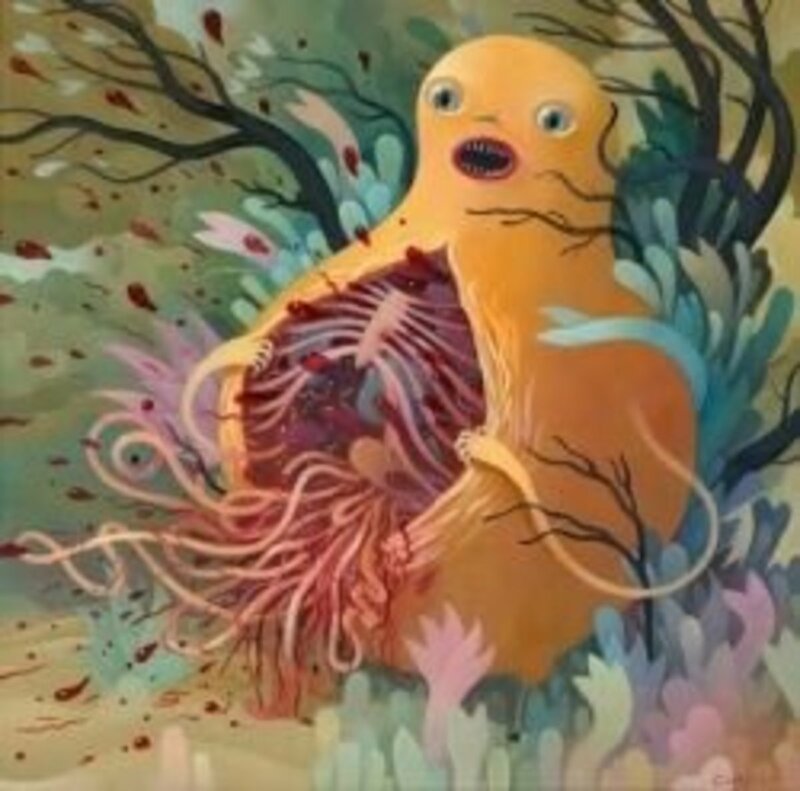 We will be turning to the thorax next, where we will cover the body wall, diaphragm, and lungs in lesson 7 and the mediastinum and heart in lesson 8. Then, we will turn to the abdomen before focusing on the pelvis and perineum.